After decades of prioritizing through-movement and vehicle priorities on our streets, governments have started to rediscover the broad role that streets can and should play in public arenas such as commerce, socialization, community celebration, and recreation. One of the first innovative modern government guides in this area, the UK's Manual for Streets, published in 2007, states: ‘‘For the last fifty years, urban street planning and design in the UK and several other European countries has been led by traffic engineers who have given priority to the needs of motor vehicles. This has resulted in street environments that are unattractive for people on foot, whether traveling along the street, or using the street as a destination for economic or social activities.” It goes on to discuss how transportation agencies have detailed design standards and regulations to facilitate vehicle travel on streets, but states that “nothing comparable exists for many of the other street activities.” To remedy that, the Manual for Streets and the related Link and Place Guide instead consider the context and role for a street. Streets in which movement is the priority are called "Links," while "Place" is the category for “a street that is a destination in its own right: a location where activities occur on or adjacent to the street.” These guides suggest that while transport planners and engineers should take the lead in planning and managing Link streets, urban planners and urban designers should take the lead on Place streets. Similarly in the US, New York City’s Department of Transportation broke ground with its Sustainable Streets strategic plan, released in 2008, which includes a focus on recognizing “streets as vital public places that foster social and economic activity, in addition to their more traditional roles as corridors for travel.” This document outlined a series of policy and programmatic priorities to “make our streets great destinations,” including the launch of the Public Plaza initiative, raising the agency’s streetscape standards, expanding a public art on the streets program, and fostering temporary and permanent pedestrian streets. In the years that have followed, transportation agencies and other departments that impact how streets look and function—which can include more than a dozen agencies ranging from Planning to Parks & Recreation in a typical city—have created a number of innovative programs, standards, and policies to foster Streets as Places. 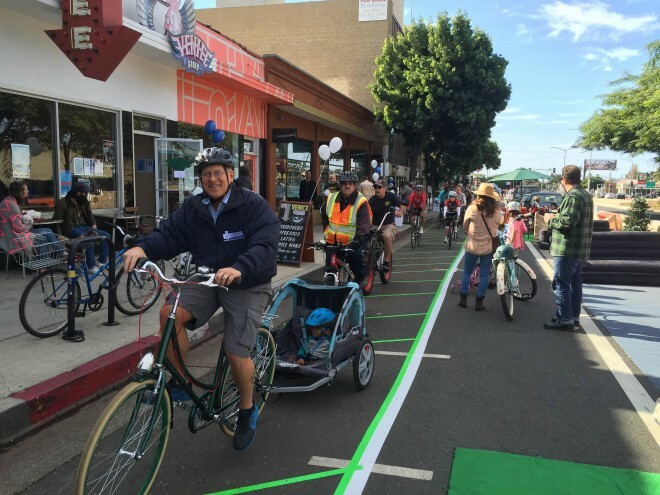 The best of these support community-led visions and proactively engage residents, businesses, and local groups in the process of remaking streets. While there are still barriers that exist in this are—including the traditional mobility-focused missions of transportation agencies, a lack of coordination between the departments that impact and use the right-of-way, and complex regulations and permitting processes we're living in exciting times—where the role of streets is being rethought in communities across the country. 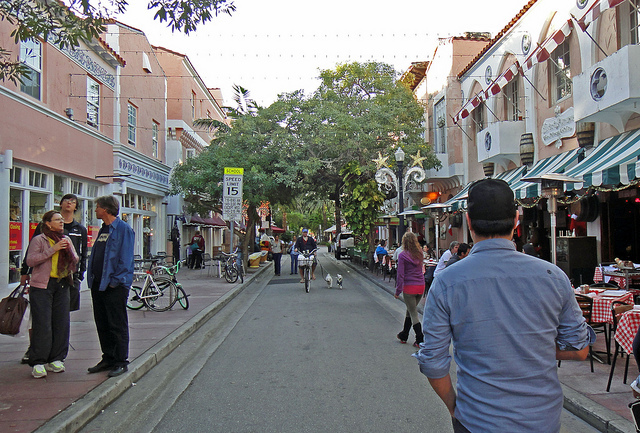 Below are some ideas for how government leaders and agencies can create Streets as Places; other pages in this resource also discuss the important role that individuals, as well as institutions and community play in activating streets. Help us add other examples to this page! Add your suggestions about other ways people can create streets that bring people together in the comments section, or by emailing transportation@pps.org. Encourage Intersection Repair Projects. Portland’s Department of Transportation manages an Intersection Repair program in conjunction with the City Repair Project that allows community residents to apply for permits to paint intersections, as well as to install nearby benches, planters, arbors, and kiosks to make intersections community gathering places. Research conducted on these projects shows that they have been connected to enhanced sense of community, greater social interaction, and better reported general health. 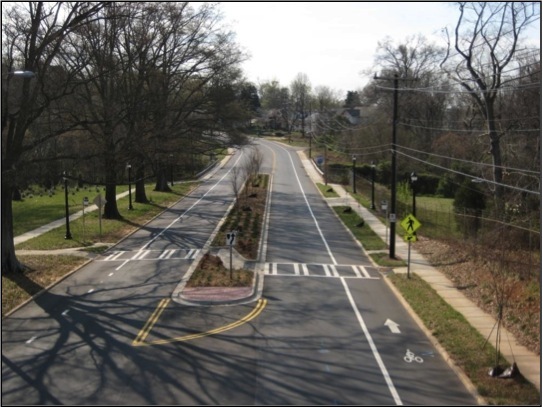 Allow Citizens to Adopt Street Medians. Los Angeles’ Adopt-a-Median program allows community groups to plant and install signage, murals, and street furniture in street medians, as long as the group maintains the improvements indefinitely. The Board of Public Works’ Office of Community Beautification coordinates the City's approval and permit application, waiving all fees typically associated with improvements in the right-of-way. The city will also loan hand tools for the work and provide liability coverage. The Woodman Avenue Multi-Beneficial Stormwater Capture Project [PDF], a collaboration between city agencies and neighborhood groups, includes a landscaped median maintained by Kaiser Permanente through the Adopt-a-Median program. Let Residents Design Crosswalks. 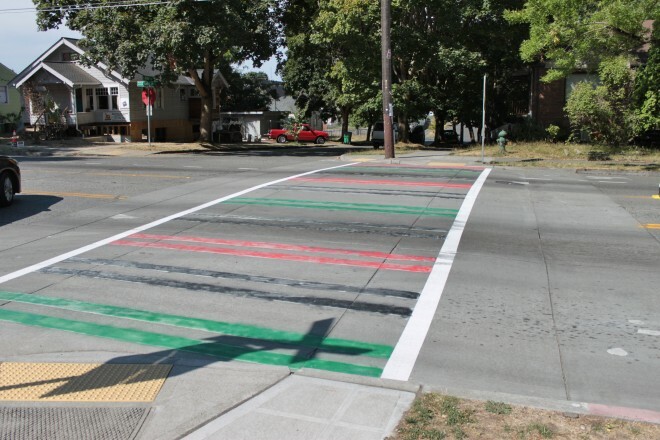 In an effort to foster a sense of place and build community, Seattle’s Department of Transportation allows community members to design their own crosswalks by submitting requests through the city’s Neighborhood Matching Fund. The program is an effort to incorporate more neighborhood character into the city’s streets and give residents an opportunity to get to know their neighbors through a local Placemaking project. The CityBench program is a NYC Department of Transportation (NYCDOT) initiative to increase the amount of public seating on New York City’s streets, encouraging pedestrians to linger, rest, and observe the street. Citizens, businesses, and institutions can recommend locations for NYCDOT to install free benches, with a priority on bus stops, retail corridors, and areas with high concentrations of senior citizens. 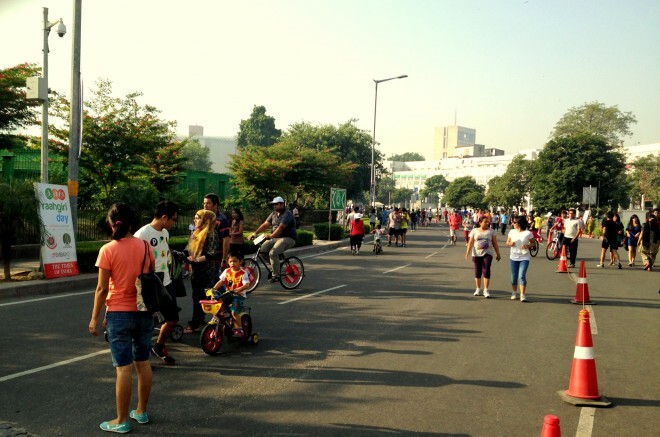 Open Streets, Play Streets, and Ciclovias temporarily close streets to automobiles so that people may use them for healthy and fun physical activities like walking, jogging, biking and dancing. These initiatives have been hosted in many cities around the United States and in countries all over the world. The City of St. Albert in Canada actively promotes neighbors organizing block parties as a way to better communities. Residents can fill out a simple online block party request, which is supplemented by a hard copy of local support signatures that must be turned in 10 days before the party, and the government block party webpage includes a how-to guide with tips, a sample evaluation form, a sign in sheet template, and access to resources like free game grab-bags and opportunities for free food. There are even suggestions for how people can organize winter block parties in the cold. Close Streets to Vehicles for a Weekly Ciclovia. 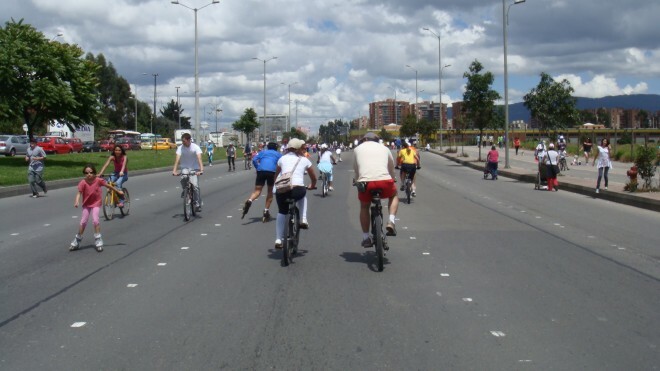 Bogota, Colombia pioneered the Ciclovia movement when city authorities experimented with temporary road closures in 1974. Today, Bogota's Ciclovia has developed into a weekly, 7 hour Ciclovia event that closes nearly 70 miles of city streets to vehicles each Sunday and opens them up to walkers, rollerbladers, dancers, cyclists, and aerobic exercisers. This event, which can draw up to 1.8 million people, has inspired other communities across the world to start their own Ciclovia events. Ciclovias give people the freedom to discover their city in a new way and get to know your fellow neighbors. As stated by Gil Penalosa, former Parks and Recreation Commissioner in Bogota, "it is like a gigantic paved park that is open 7 hours a week, and people of all ages and backgrounds take over the otherwise car dominated space and have fun." Open Main Streets to People. Open Streets Minneapolis in Minnesota brings together community groups and local businesses to temporarily close major thoroughfares to car traffic, and open them up for people walking, biking, and skating. 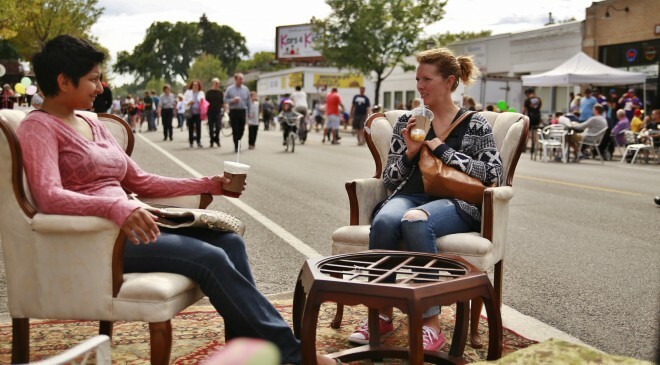 More than a street festival, Open Streets Minneapolis gives residents an opportunity to explore their neighborhood and rethink streets as public space. In 2015, over 65,000 people attended eight Open Street events in Minneapolis. Program Car-Free Events. Every Sunday in Gurgaon, India, streets are temporarily closed to cars and open for people for an event called Raahgiri Day . 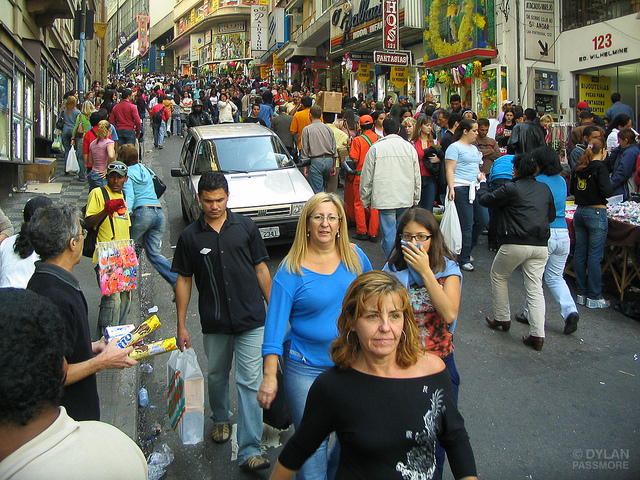 Children and adults are encouraged to socialize in the streets with free community events, such as soccer games and zumba classes, in addition to car-free walking, bicycling, skating, and more. With its imaginative planning methods, the City of San Francisco has made the reclamation of public spaces for pedestrians a priority. Through its Pavement to Parks Program, the city has created six pedestrian plazas and more than 50 parklets that convert parking spaces to small park spaces. 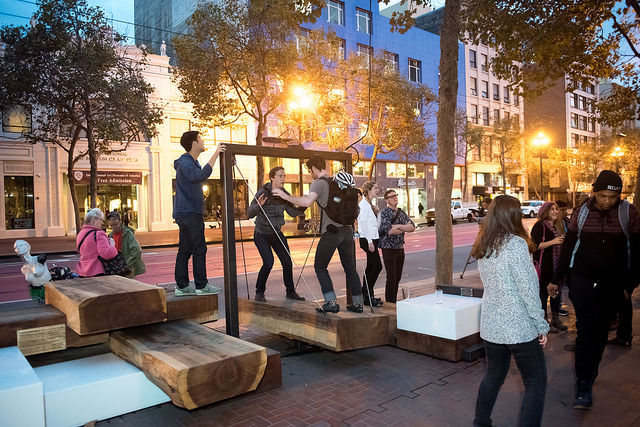 Sidewalk activation initiatives such as the swings on Market Street featured in the photo above encourage social interaction and lingering on the streets of San Francisco. 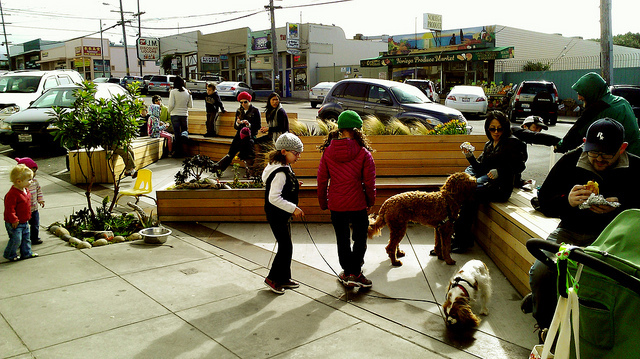 Community groups and others can apply to sponsor pedestrian plaza or parklet programs, using the City's Plaza Proposal Package and user-friendly Parklet Manual. The City of Los Angeles, California has more streets than anywhere else in the US, and as in most American cities, the majority of LA's streets prioritize cars over people. However, the Los Angeles Department of Transportation is shifting its focus back to place and people with its People St program. 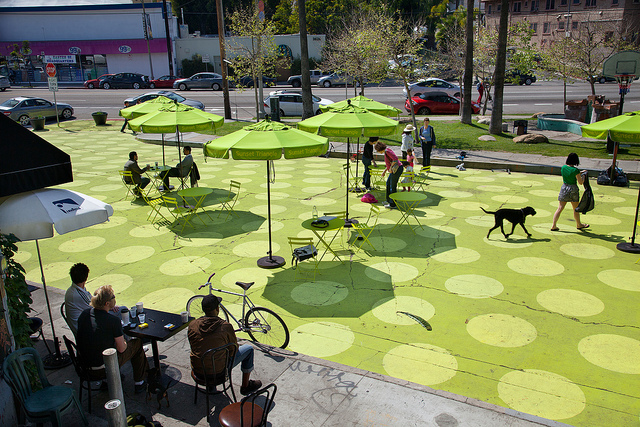 People St is an initiative to create streets that are more inviting and vibrant for pedestrians through the design and installation of plazas, parklets, and bike corrals throughout LA. Each People St project type has a pre-approved Kit of Parts that contains packaged configurations to help reduce applicants’ design costs. 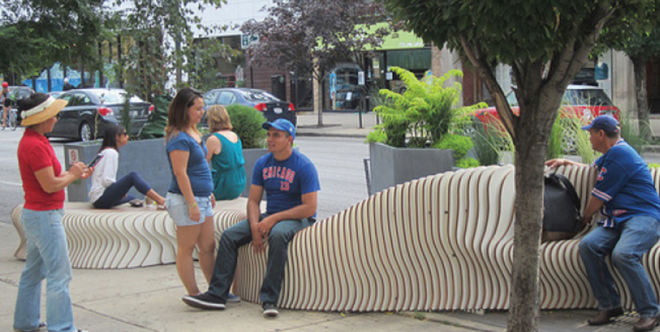 The Chicago Department of Transportation’s Make Way for People initiative aims to create public spaces that cultivate community and culture in Chicago’s neighborhoods through Placemaking. 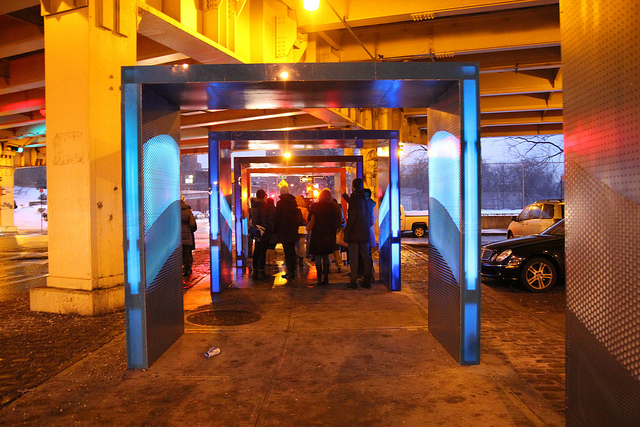 Make Way for People supports innovation in the public way by opening Chicago’s streets, parking spots, plazas, and alleys to new programming and market opportunities. In addition to improving street safety and promoting walkable communities, this initiative supports economic development for Chicago’s local businesses. The New York City Department of Transportation Art Program partners with community organizations and local artists to bring art to the city’s streets, with a range of programs that employ artists, in partnership with local organizations, to address community requests for site beautification. For example, the Barrier Beautification and Asphalt Art Activation programs invite artists to submit proposals for painting concrete street barriers (often used to protect bike lanes or sidewalks), and asphalt around bike share stations, respectively, at sites that are selected based on community requests. 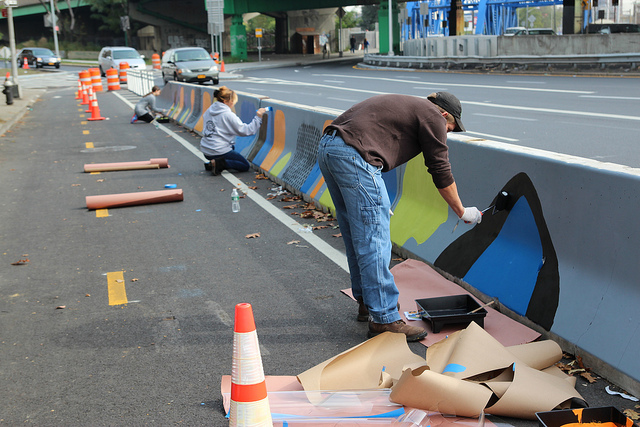 NYCDOT and its partners cover the cost of paint and materials and pay an honorarium for artists. 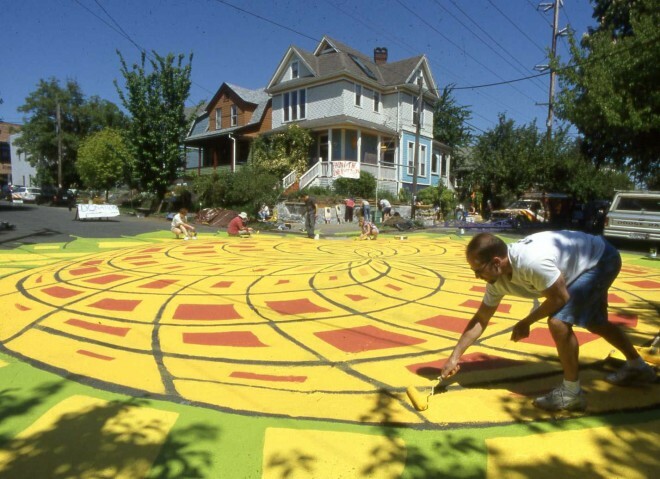 Then, in a single day of painting, volunteers assist artists with producing designs that offer a unique, unexpected, and colorful addition to the streetscape. 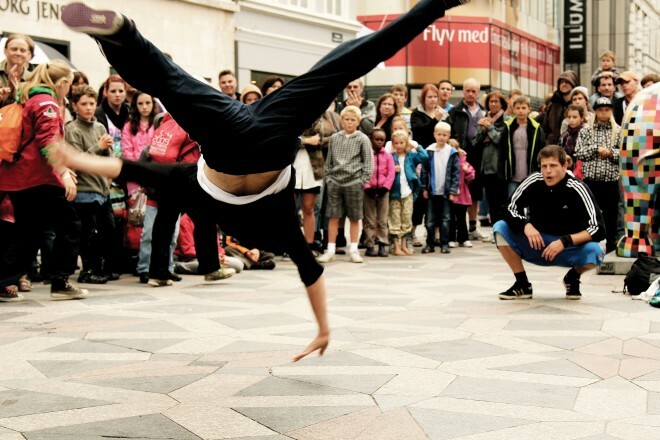 Street performers, also known as buskers, support lively, social, and exciting streets. Melbourne, Australia, ranks first for supporting their busker community by The Busking Project. The City’s policy features four types of licensing, each reflecting a particular busking type. Auditions are only required for dangerous performances and are conducted by a buskers' association. Amplification is permitted without any additional license requirement and sound level is regulated by local police. Key to Melbourne’s success is the cooperation between the City and the busker community, who were involved in the policy creation. There is also a specific busker manager within City Hall who acts as the person of contact for all questions and concerns. This partnership has fostered a strong busking scene in Melbourne, which has also been adopted into Melbourne’s cultural policy and branding. Other cities that rank well for supporting street performance are those with relaxed busking management in terms of performance duration, location, and auditions. Governments can also encourage visitors to enjoy performances through signage, press releases, and media events. 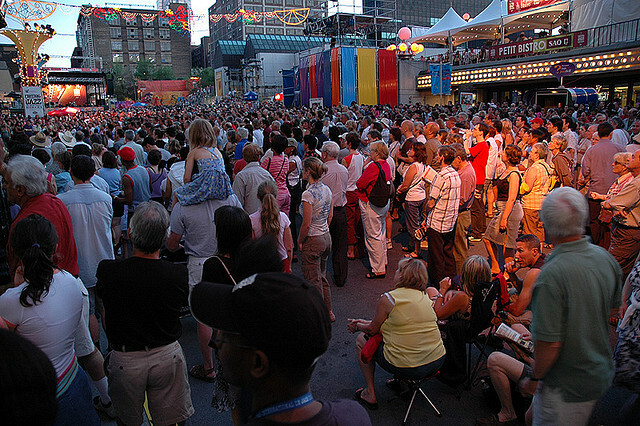 Every summer since 1980, the Festival International de Jazz de Montréal in Montreal, Canada has hosted jazz musicians from around the world in a series of indoor and outdoor venues in the heart of the Quartier des Spectacles, a public space that hosts festivals and large gatherings in downtown Montréal. Some streets are closed off to vehicle traffic and the festival atmosphere creates a vibrant street scene full of people, music, and food. Now in its seventh year, Summer And Music (SAM) is downtown Long Beach, California’s homegrown concert series, providing an entire summer of free music to the public in the streets and public spaces of the city. Produced by the Downtown Long Beach Associates, SAM has been voted OC Weekly's "Best Music Festival" three times in a row for its display of local acts at outdoor venues, with performances spanning the genres of jazz, pop, rockabilly, and funk. 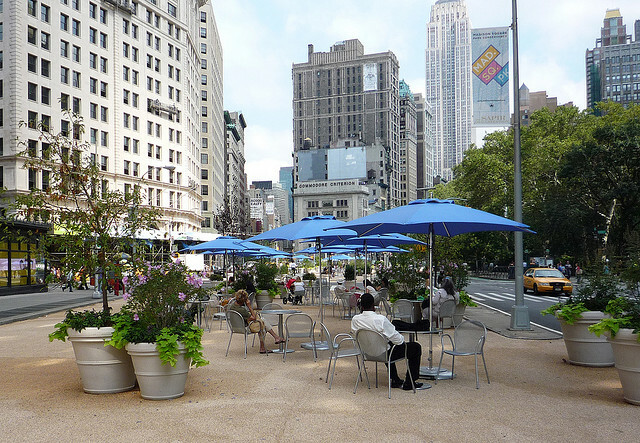 In 2008, the New York City Department of Transportation launched its Plaza Program which has successfully transformed underused New York City streets into public spaces, as part of an initiative stating that all New Yorkers should have access to open space within ¼ mile of their home. Each year, eligible nonprofit organizations can submit applications to the NYC DOT for proposed new plaza sites in their neighborhood. The DOT funds the design and construction of the plaza. 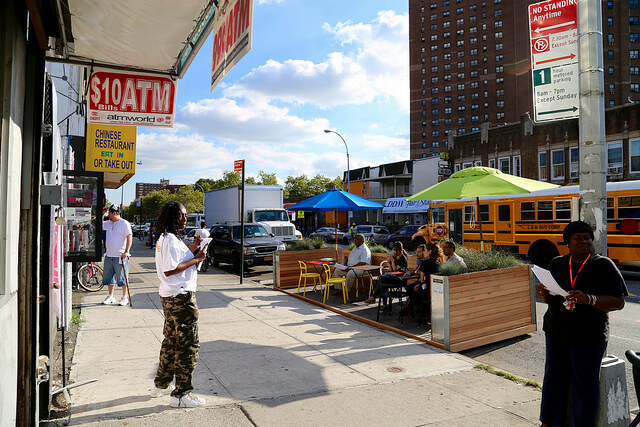 Moreover, the DOT assists its nonprofit partners in creating a design that meets the needs of the neighborhood by hosting public visioning workshops in the communities selected for plazas. The Great Streets Challenge Grant program is a partnership between the Los Angeles Mayor’s Office and ioby.org, a crowd-resourcing platform for citizen-led, neighbor-funded projects. The grants award a total of up to $200,000 to community groups with innovative ideas for improvements along the initial 15 streets of Los Angeles’ Great Streets Initiative. Participatory budgeting gives community members an opportunity to directly impact how to spend part of a city’s public budget, capturing local expertise and aspirations. This past year in New York City, 27 City Council members allowed their constituents to decide how to spend a total of $30 million of the public budget. A variety of projects were chosen, from playgrounds to libraries, as well as a number of street improvement projects. In the near future, residents will see local projects constructed that they developed and voted for, such as sidewalk repair ($50,000), raised crosswalks ($250,000), greenway bike and pedestrian path improvements ($200,000) and new sidewalk trees ($300,000). A policy framework invented and first implemented in Sweden in 1997, Vision Zero has become a multi-national project with a goal of reducing deaths and serious injuries on streets and roads to zero. A central principle of Vision Zero is the value of human life, which in a humane society cannot be exchanged for monetary value as it is in the cost-benefit analyses of conventional transportation engineering. The Swedish version of the policy focuses on planning for and mitigating driver mistakes through safe infrastructure design. Since its implementation, the annual fatality rate on Sweden’s roads has fallen from 7 per 100,000 to less than 3 per 100,000 (as of 2014), one of the lowest rates in the world. 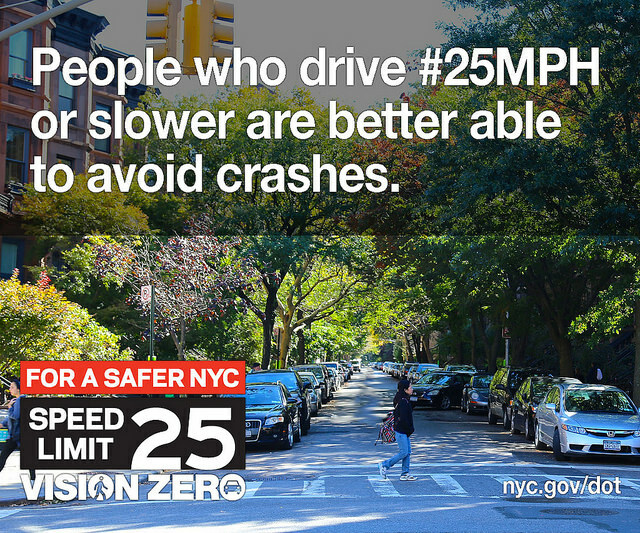 Today, Vision Zero policies have been adopted all over the world. Austin, Texas's 2014 Complete Streets policy recognizes that streets are a vital part of the community. “The design of cities begins with the design of streets as community places where people want to be,” it states, adding that street projects shall be approached as opportunities to enhance the public realm “through the thoughtful creation of place.” It recommends that street trees, public art, pedestrian amenities, sidewalk cafés and street-facing retail be included in Complete Street designs in order to create community places where people want to spend time. More than 700 agencies throughout the country have adopted Complete Streets policies, which aim to ensure that streets for everyone, and that they are designed and operated to enable safe access for users of all ages and abilities. In 2013, the State of Washington passed a Neighborhood Safe Streets Bill that allows cities to reduce speed limits to 20 mph on side streets without the need for costly traffic engineering studies. This allows resources to be spent instead on other safety improvements to calm traffic and reduce dangerous driving on neighborhood streets. Creating streets that are welcoming to bicyclists is a powerful way to convey the ‘streets are not just for cars’ message. 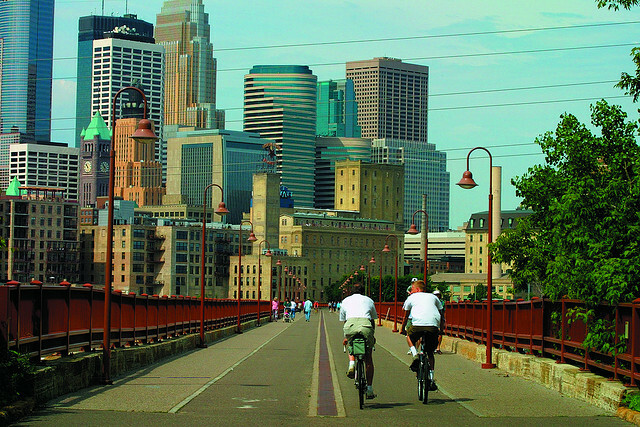 Despite its long and cold winters, Minneapolis, Minnesota became the first US city to be featured in the Copenhagenize Index of bike-Friendly cities by making pedestrians and cyclists a priority. The City has built more than 118 miles of on-street bike lanes, over 96 miles of protected bikeways, 15 miles of shared bike lanes, and 20 miles of bicycle boulevards, totaling up to a 213 mile bicycle network. 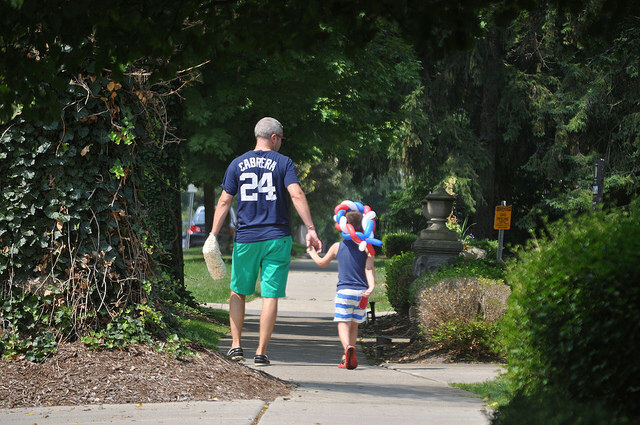 After three decades of 20th century population loss and commercial decline, Birmingham, Michigan, committed to building a new identity - “The Walkable Community.” In 1996 the city resolved to pursue new strategies of calming traffic, building parks, improving streetscapes, and reforming its regulations to support this goal. It instituted a form-based code, encouraged buildings at the sidewalk line, and narrowed its Main Street with the addition of a center median and angled parking. Now, the city’s downtown is a walkable place and Birmingham has grown steadily since the turn of the millennium—even in the midst of economic decline across its region. Burlington, Vermont’s Department of Public Works has a Safe Routes to Schools program that facilitates pedestrian safety improvements, such as upgraded pedestrian signals, new sidewalks, improved crosswalks and crossings, and radar speed feedback signs for drivers. This support from the city helps children and their parents take advantage of safe, enjoyable walking and biking routes to get to school, increasing both the volume and diversity of street activity. At the state level, the New Jersey Department of Transportation's Safe Routes to School program aims to encourage more students to walk and bike to school where it is safe to do so, and to improve the areas where it is not safe. 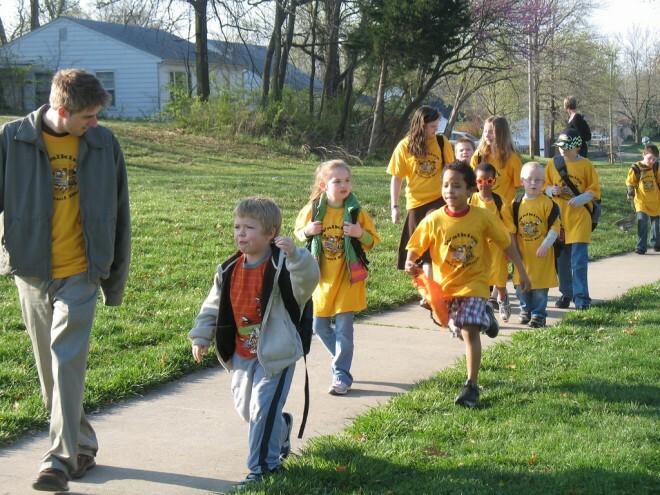 The state provides funding, through a Safe Routes to School grant, to schools and communities to improve pedestrian and cycling conditions, and provides resources to help facilitate the process. After starting as a ‘guerrilla street tactic’ without City sanctioning, the wayfinding signage that activist Matt Tomasulo put up around the Raleigh was endorsed by the City’s Planning Department. These simple signs, lashed to light poles at a few of the city’s key intersections, let residents and visitors know what attractions and amenities can be found within walking distance and how many minutes it would take to reach them on foot. 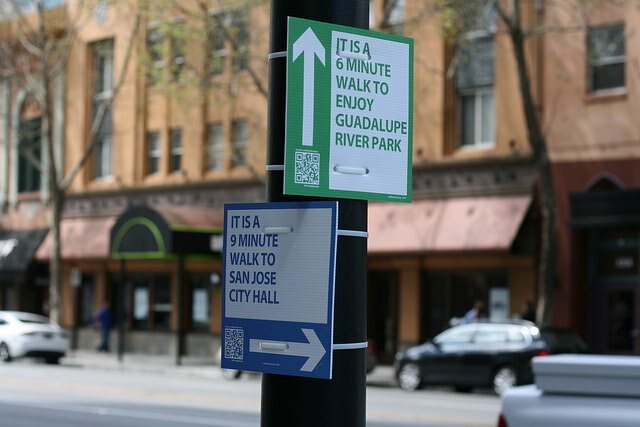 Tomasulo then launched a Kickstarter campaign to create a website, Walk [Your City], that allow activists around the country to design their own low-cost wayfinding signs, complete with QR codes that users can scan for detailed directions and information on attractions. Since its inception two years ago, more than 100 communities have ordered signs through the site—places like Mount Hope, West Virginia, a town of 1,500 that created 70 guideposts for tourists who would be coming to town for a big summer event. In the mid 1990’s, London’s most famous square was virtually inaccessible, choked on all sides by congested traffic. 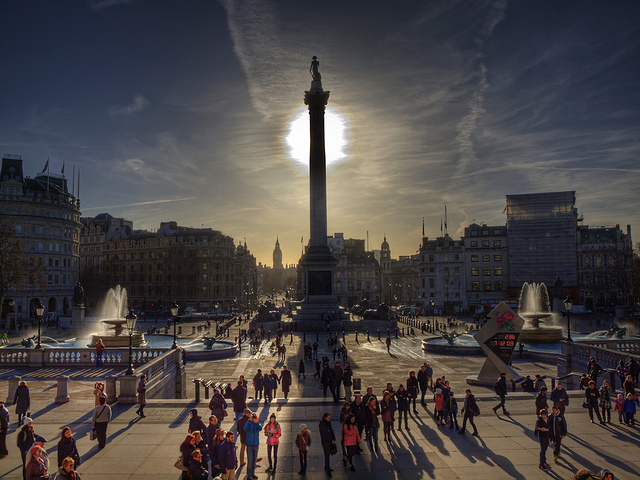 The transformation of Trafalgar Square was made possible by closing the north side of the square to vehicle traffic, and creating a broad terrace that now links the National Gallery to this newly restored, magnificent civic space. Similarly, before its transformation in 2013, the Place de la République in Paris, France was an underutilized space composed of two gardens at the center of a highly trafficked roundabout. Vehicle traffic occupied over two-thirds of the square's surface. The redesign shaped new traffic patterns, while creating a more welcoming public space in the square. 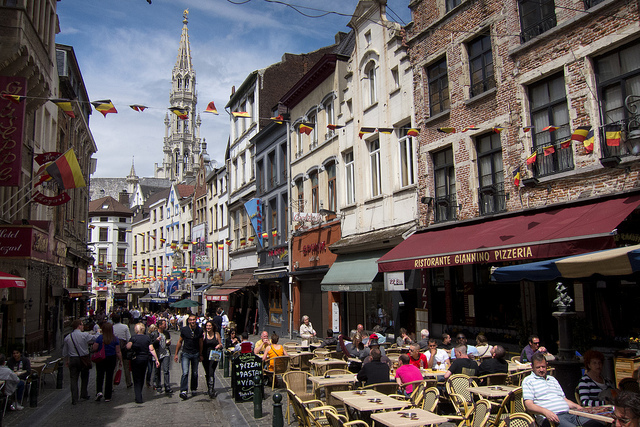 Six vehicle lanes were removed, and traffic is now limited to the periphery of the square. 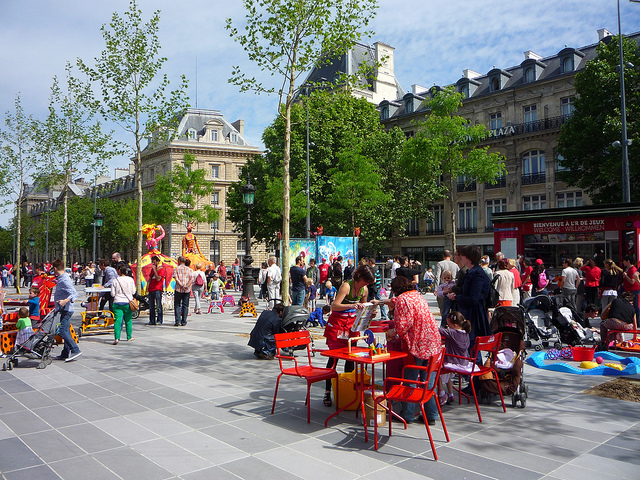 Today, Place de la République is a two hectare space dedicated to pedestrians and cyclists with a reflective pool, seating options, rows of trees, and a pavilion. Auckland, New Zealand has a shared space program dedicated to creating slow speed streets where pedestrians have right of way, but vehicles are still permitted. A typical design element is to remove curbs on a shared space street, which gives pedestrians access to the full right-of-way and provides more room for people walking, outdoor dining, and other street activities and events. Since 2011, new shared spaces have opened on five streets throughout the city, and project evaluation has shown these redesigns to increase foot traffic, reduce vehicle speeds, and increase spending in local shops and restaurants. Boulevard Vitosha was once a busy street in Sofia, Bulgaria with lots of traffic congestion, a streetcar, and some high end shops - but not an enjoyable place to walk due to cramped sidewalks and loud car traffic. 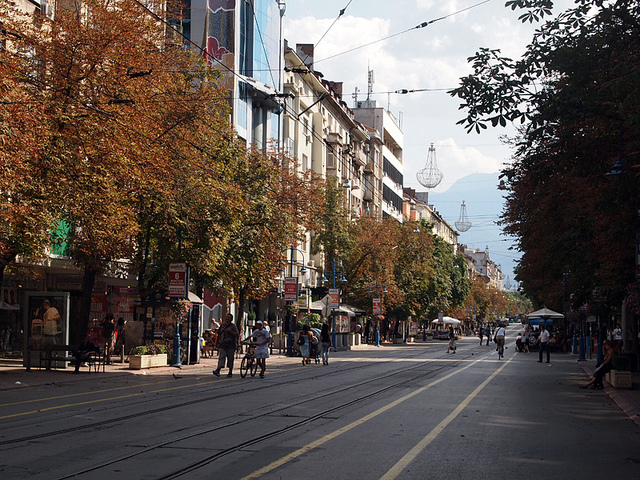 In the 1990s, Sofia’s city government implemented a no-car zone for a portion of the boulevard, but did not change the streetcar and street infrastructure. In recent years the boulevard has undergone a transition with a new subway eliminating the need for ground transit. The no car-zone has been renovated so that the stretch is paved in a pedestrian-friendly, accessible way, opening opportunities for outdoor cafés to flourish. Now, Boulevard Vitosha is a pleasant and inviting public space that is a destination for pedestrians. Wynkoop Plaza, located on the east side of Denver, Colorado’s Union Station transit hub, includes fountains, event spaces, gardens, and landscaping. The plaza is managed by Denver’s Regional Transportation District, which contracts with a private event manager to program the space. The space is designed to accommodate stage performances, festivals, vending carts, games, and other activities. 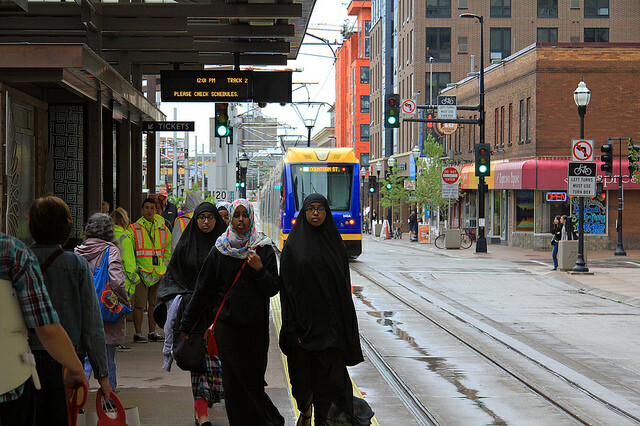 Minneapolis and St. Paul, Minnesota’s Metro Transit system’s new Green Line light rail has invigorated businesses and public spaces along the street. At the Victoria Street Station, the new light rail infrastructure is contributing to investment in public space by Model Cities, a nonprofit human service and community development group that hopes to begin construction on two sites at or near Victoria Street Station. The Model Cities projects would bring two new pocket parks, public art, and a reading room that focuses on the role African Americans played in St. Paul as part of an effort to create a distinct cultural district that celebrates the area’s history and the mix of cultures that now reside there. The Living Room Station is a bus stop in downtown Minneapolis, Minnesota that has amenities one would typically find inside of a home: seating, a rug, reading materials, and occasional programming, such as Trick or Treating. 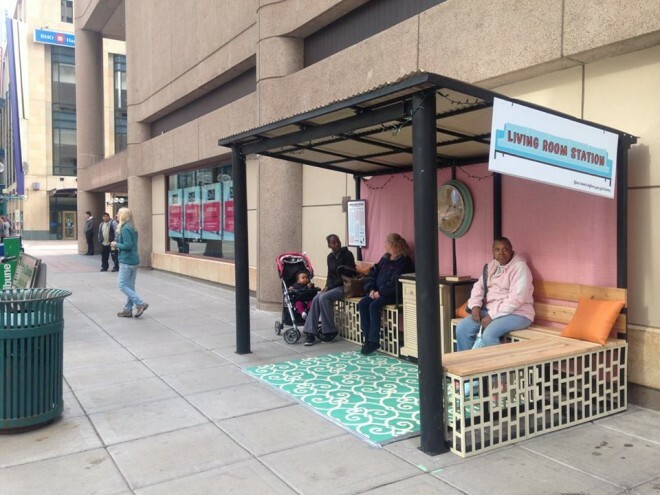 Created by a local placemaking organization, The Musicant Group, this pilot project launched by Metro Transit is testing ways to improve transit waiting areas in downtown Minneapolis, most of which are high ridership bus stops that are currently uninviting spaces. ‍In New York City, it is required to use densely planted shrubs and trees to mitigate parking. 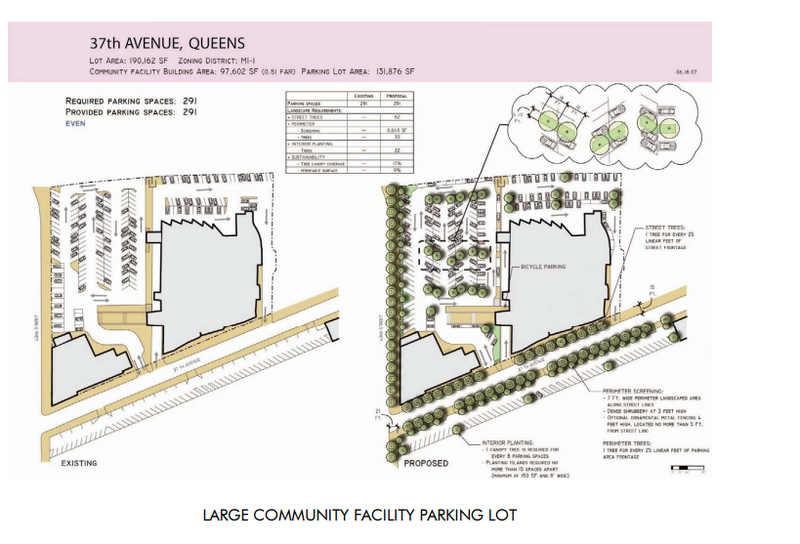 In this photos, proposed changes to a parking lot in Queens would improve the aesthetic and experience of street life. Photo courtesy of NYC Department of City Planning. In New York City, a policy requires that parking lots with 18 or more spaces or 6,000 square feet alongside a street must provide visual screening in the form of landscaping. This requirement to mitigate parking, using densely planted shrubs, improves the aesthetic and experience of street life for passerby. A policy in Philadelphia requires that parking garages fronting a sidewalk or public space must include retail uses at their ground floor. This rule allows for parking garages to exist without taking away precious space on the street for a variety of commercial uses and activities. In July of 2015, the Minneapolis City Council passed a change in parking requirements for neighborhoods well-served by transit, either significantly reducing minimums for new development or eliminating them altogether, depending on the location. Off-street parking lots and structures (which are often required by city ordinance to be provided by developers at a minimum level for new development or renovations) can overwhelm the local landscape and create dead zones along streets, inhibiting street life. By eliminating or reducing these minimums and cutting down on the number of off-street parking lots and structures, a city can open up new space for mixed-use development and public spaces to create interesting, enclosed edges along the sidewalk. In 1989, Zurich, Switzerland added parking maximums to their existing parking minimums, with the intention of protecting the downtown from having too much parking. These maximums were lowered over time. In 1996, parking in the core of the city was capped at the 1990 level, and in 2010 a default maximum was added for the whole city, with lower caps for areas served by transit. As of the London Plan 2011, London abolished parking minimums and established parking maximums for retail, office, and residential uses. The city did set minimum parking standards for bicycle parking. In partnership with the New York City Department of Transportation, the Design Trust published a recent report called Under the Elevated, which examines how to transform the public spaces under NYC’s 700 miles of elevated transit infrastructure into spaces that are community assets, rather than eyesores. Main Street in Urbana, IlIllinois has undergone significant transformation in the past 33 months. City TIF grants and creative real estate approaches have focused on shared spaces that allow businesses to activate the street. Mixed-use initiatives have enabled multiple tenants to collaborate in activating spaces such as coworking/incubator spaces; a combined pizza restaurant and cafe; and an upcoming outdoor gallery, beer garden and event space. 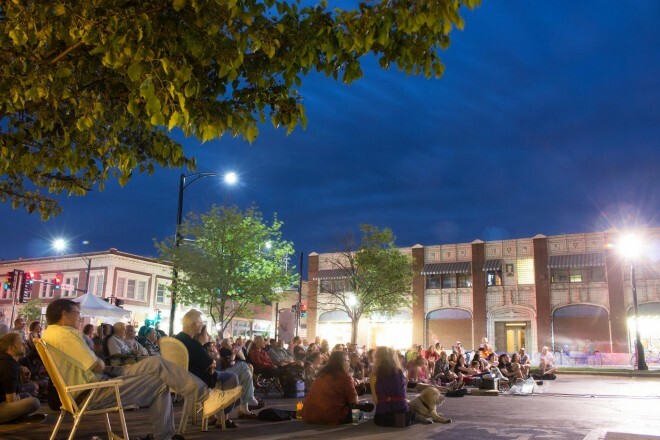 The city has also helped set the table for greater activation of the street by building extended sidewalk seating in former parking spaces, organizing summer movie nights in private parking lots, and promoting downtown using the hashtag #urbanalove on social media. From sidewalk cafés to seating to retail displays, private business has an important role to play in activating sidewalks, particularly along commercial streets. An initiative by Creative Communities in North Palmerston, New Zealand works with local retailers to help them create more dynamic, lively storefront displays and sidewalk activations. A recent project focused on the downtown street of Broadway, where shop owners added planters, outdoor seating, banners, and other features to create a more welcoming street for pedestrians. The New York City Department of Transportation’s Street Seats program enables the creation of seasonal public open spaces, generally including seating and tables, at locations where sidewalk seating is not available. NYCDOT allows businesses or others with ground-floor frontage to apply to convert parking spaces into parklets during warmer months. 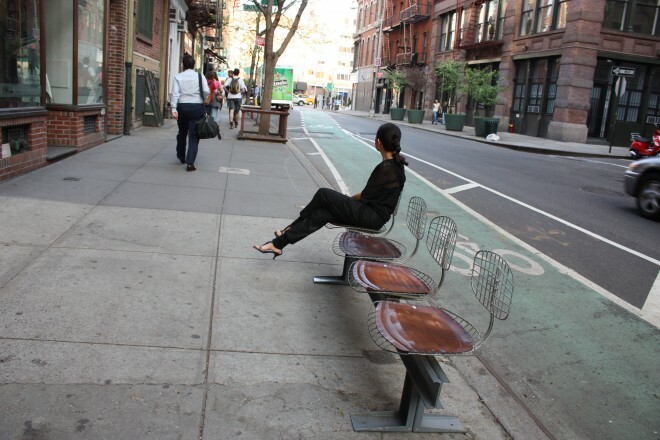 While the sponsoring entity pays for the costs of design, materials, and installation, NYCDOT provides design guidelines and an accessible application process to facilitate the implementation of Street Seats. Warwick, Durban is a busy street trading area, as well as an important business and socializing space in the city. For several decades, local officials worked with street vendors to improve the area’s condition through the creation of policy and design strategies under The Warwick Junction Urban Renewal Project. The result has seen the creation of kiosks with water and electric, widened sidewalks, lighting, and safe lockers to store supplies overnight, which all help to make street vending more viable and safe. 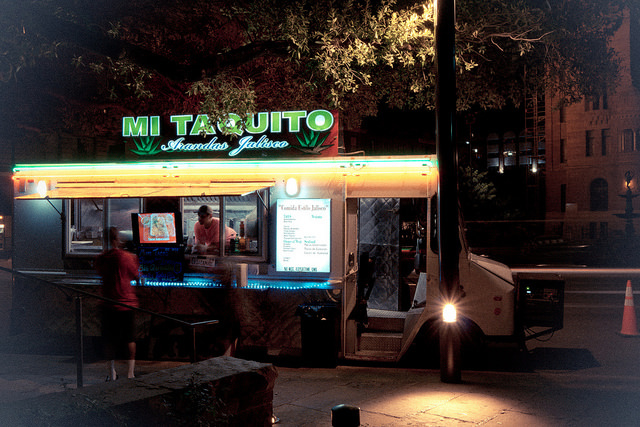 San Antonio, Texas has a bustling street vending scene, which is largely supported by its government. Street vending requirements are broken down in detail by food types and are listed in both English and Spanish on the city’s website. Permits are relatively simple to obtain. One issue, however, is the requirement for food trucks to remain 300 feet away from any brick-and-mortar food establishment. This often undermines food trucks' ability to stay on the street and leads to food truck parks instead. 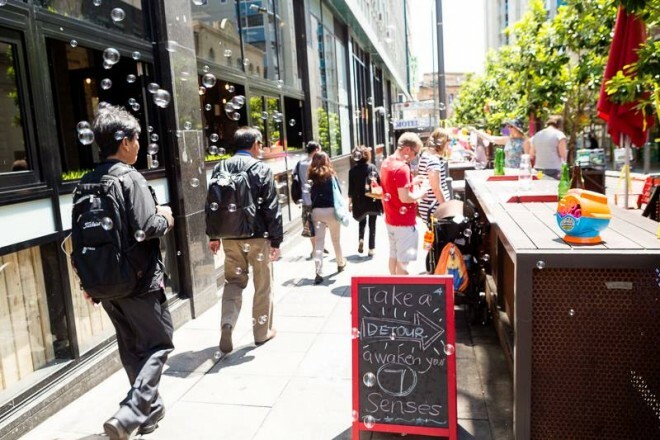 Adelaide, the capital of South Australia, has an official City placemaking strategy, which it has used as a driving force for revitalization, citizen empowerment, and creative experiments. Improvements to the city’s streets and public spaces - such as on Melbourne Street - are driven by community recommendations and engagement. Adelaide has pioneered many government innovations, including designating a ‘Place Facilitator’ for each part of the city, who acts as a single point of contact to for community members, businesses, and others, to help navigate what is typically a maze of government bureaucracy to activate and change the public realm. The city has also prioritized Lighter, Quicker, Cheaper improvements through Splash, a series of urban space experiments, including nighttime markets, relaxing urban retreats, live music, and cultural extravaganza throughout Adelaide. Historically, street design manuals have focused on the automobile, with regulations prioritizing vehicular traffic and speed over livability and character for pedestrians. Today, communities across the world are looking to update their street standards to be more holistic and to recognize the critical public space role that many streets play. As New York City’s former Mayor Michael Bloomberg wrote in the introduction to New York City’s Street Design Manual: “The Streets of New York are often seen as permanent fixtures of city life, and in some ways, they are. But our streets are also dynamic, and their character and uses can change as the city continually evolves and reinvents itself.” The manual provides guidance in designing street features that support the role of streets as public spaces, including street furniture, pedestrian-scale lighting, landscaping, and safe pedestrian and bicycling infrastructure. In 2010, The City of San Francisco adopted its Better Streets Plan that provides comprehensive guidelines for the design of the city’s streets, with a particular focus on pedestrians and how streets can be used as public spaces. Englewood, Colorado’s zoning ordinance requires certain new retail developments to include design elements that foster placemaking, such as aesthetically diverse and interesting exteriors and customer entrances, pedestrian connectivity, and unintrusive storage, loading, and garbage areas. Perhaps most uniquely, the standards require the inclusion of community amenities, such as patios, pedestrian plazas with seating, public art, or outdoor playgrounds. Philadelphia, Pennsylvania looks to avoid blank walls at ground floors by requiring that all facades have at least 17.5% of their space used as windows or main entrance doors. Ground floors with ample doors and windows create a more stimulating experience for pedestrians. They also foster “eyes on the street” and encourage greater safety. In Nashville, Tennessee, owners of ground floor spaces on primary and secondary streets, as well as those that face public spaces and pedestrian passages, are required to provide active uses such as retail, office, institutional, or recreational facilities. This policy supports animated ground floors and discourages problematic uses at street level, such as parking garages. Buildings codes and land-use policies dictate the relationship between buildings and the public realm and have a huge impact on whether a street is a place where people feel comfortable and will want to spend time. Typically, conventional zoning regulations require segregation of different land uses and minimum building setbacks, almost guaranteeing that a sense of place cannot be created on streets adjacent to new development. Form-based codes are an alternative way to regulate development that focuses on regulating the physical form of development, rather than its use, which makes it easier to create a desired public realm and sense of place.